So we went on a hike on the Washington Coast last weekend and it was amazing. After a 3 hour drive and 2 mile gentle hike, we found ourselves on the Washington coast… and I cannot tell you how to get there. You see when we went on the hike to Tubal Cain Mine last year we were joined by some friends Anne and Paul. As is customary with any hike, once the evening sets in and you’re huddled around the flashlight lantern (burn bans) you start talking about hikes. Well Ann and Paul told us about a place along the Pacific North West Trail that sounded wonderful. They then swore us to secrecy about their secret trail head that turned a 14 mile round trip into a 4 mile round trip. Well last weekend we finally got around to doing that. It was great time, except for when some of our party went off trail mushroom hunting and lost their way for a little while. I brought along the KX3 and borrowed Chris’ HAM Stick to see if I could make some QRP QSOs with a saltwater ground plane. Total fail. I really have to work on my QRP skills. Because of the surf and beach, there was no easy way total advantage of the saltwater for the radials on my antenna. I could hear plenty of activity on 15 meters for the CQ Worldwide DX contest going on. My 5 Watts was just not cutting it though. I should have just brought an antenna launcher and set up a random wire antenna in the trees. For lunch I had my now traditional steak and roasted peppers prepared over my BioLite Stove and grill, along with a good single malt scotch. Afterwords, thanks to our mushroom hunters we has some fresh chanterelle mushrooms at the trail head before heading home. So it’s hard to write this hike up and also stick to our non-disclosure agreement with Anne and Paul about revealing how we go there… I’ll just say that if you enter the destination into Google Maps, it will take you to the very spot where we parked the Jeep. 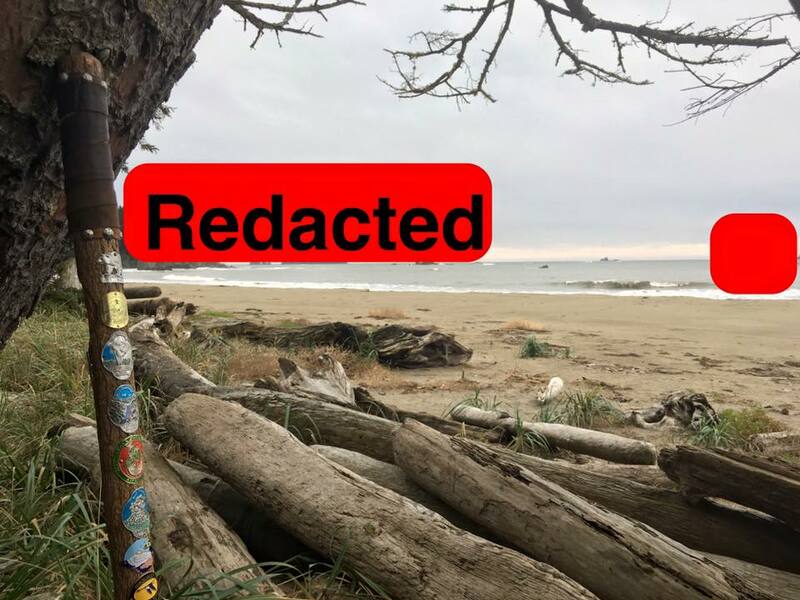 So here are some heavily redacted photos so as to keep the location safe. This entry was posted in All, HAM, Hikes, Outdoors. Bookmark the permalink.